The blog “Hair and Death in Ancient Egypt“ started in May 2013 as a way of transmiting the results of my research about the mourning rite in the funerary ceremony of Ancient Egypt. Especially base on Egyptian art and religious texts. At the beginning the posts were about the progessions on the research and the final conclusions which formed my doctoral thesis. Nowadays I write regularly about many different aspects of the funerary ceremony of Ancient Egypt in general and the Egyptian mourning rite in particular, and all of them are based on Egyptian art. The images that Ancient Egyptians have bequeathed us, are one of the biggest sources of information for Egyptian civilization. For that reason, little by little I will introduce more topics about Egyptian art. 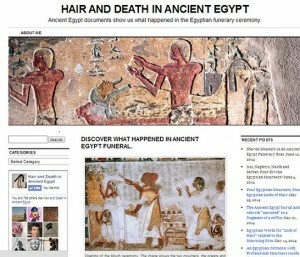 Although the name “Hair and Death in Ancient Egypt” remains as my identity sign. My intention is to transmit the knowledge of Ancient Egypt from the Egyptian art to a wider audience, with an easy language, but academic, that is, a popular science blog. Hair in the Art of Ancient Egypt for expressing Dance.